Sunnydaze Flower Blossom 3-Tier Garden Water Fountain, Black, 43 Inch Tall | Fountain City Art Ctr. 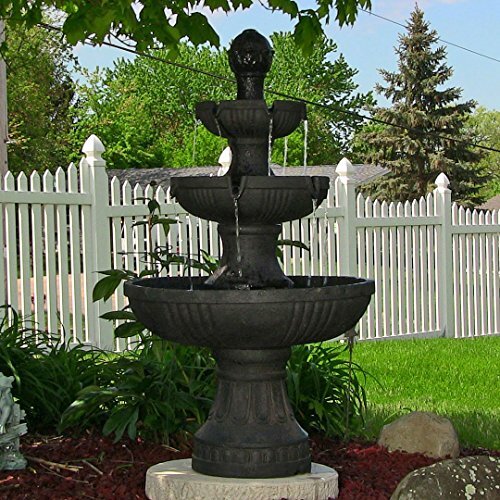 Add elegance and charm to your patio, yard, or garden with this tiered water fountain. Whether you place this in your garden, deck, patio, or porch the ample size and beauty of this piece will be sure to make a statement. The lower basin is 12 inches in diameter and 12 inches tall, the lower tier diameter is 25 inches, the middle tier diameter is 16 inches and the top tier diameter is 10.5 inches. This fountain comes in 5 pieces, and assembles easily for set up and ease of cleaning. As a bonus, the soothing sounds of the flowing water circulating and recirculating from the top to the larger bottom is sure to add a sense of calm and relaxation. No plumbing is needed as the water circulates with the electric pump. Overall dimensions: 25 inch diameter x 43 inches tall; weighs 40 pounds. Constructed from durable fiberglass resin material to ensure that it is long lasting. This comes in 5 separate pieces that spin and lock together for easy assembly and disassembly. Includes a submersible electric pump (no plumbing required) that can be plugged into any standard outlet so you can easily assemble, fill, plug it in, and enjoy. Water feature is suitable for indoor or outdoor use; however, it is not recommended for use in areas with carpet or wood floors.